Thanks to California’s initiative process, the state’s voters often have a direct say in important issues. Few voter actions have affected public education more than two such initiatives, Proposition 13 and Proposition 98. What was the Serrano v. Priest case? Is Proposition 13 popular today? Is Proposition 13 still in effect? What is the Prop 98 guarantee? What is the Prop 98 maintenance factor? What is Prop 98 funding? What did California Proposition 30 do? What funds are not in Prop 98? California's voters passed Proposition 13 in 1978, a time of enormous upheaval. The economy of the mid-'70's was reeling from a sudden increase in world oil prices driven by the creation of the OPEC oil cartel. America's economy had tipped into "stagflation," a combination of slow growth and rising prices. California home prices had climbed to levels never seen before. Homeowners, grappling with big increases in their property taxes driven by these higher prices, were frustrated and worried. Some found themselves "house rich" but unable to pay rising property tax bills. Meanwhile, the laws governing local school districts were in a state of flux. Schools in California at the time were funded by local property taxes, levied as a percentage of each property’s assessed market value at rates set by local school boards. In the landmark Serrano v. Priest case, the California Supreme Court ruled that this system violated the state constitution because differences in taxable wealth from one school community to another generated gross inequities in funding per student. As a remedy, the Court imposed a system of local "revenue limits" based on local funding levels in 1972. This change was meant to equalize funding over time, including by redistributing local tax receipts that exceeded the limits. Understandably, this Robin Hood-like approach faced criticism and may have been a factor in the passage of Prop 13. During the decade of the 1970s, the context for education finance was changing dramatically. Collective bargaining for teachers in California became mandatory through passage of the Rodda Act in 1975 with the support of a new Governor, Jerry Brown. Teacher pay rose with inflation, union power, a changing labor market that offered new professional options for educated women, and the radical idea of equal pay for equal work. School boards, trying to keep up with these forces and avoid strikes, began to find loopholes and levy new taxes that could not be redistributed. The authors of Proposition 13 pitched it as a "taxpayers' revolt." Passed by a huge margin (64.8%), this popular initiative stripped local school boards and other entities of their authority to levy taxes. It dramatically lowered property taxes to a uniform 1% of assessed value, slammed the door on known loopholes, and presented existing homeowners with a nearly irresistible temptation: a permanent tax break. At the time, inflation was increasing prices at a rate of six or seven percent annually. Under Prop 13, the taxable "assessed" value of a home is allowed to grow at only 2% per year unless sold. To prevent the state government from shifting to new taxes, the 1978 Gann limit caps the amount that the state may legally spend. Each year, the legislative analyst office (LAO) calculates the amount of "room" in the budget before the Gann Limit maximum is reached. There have only been a few years when this was an issue, but it's worth knowing about -- if only as an example of the density of the legal thicket that surrounds California's education budget. This stuff is seriously complicated. The property owners of 1978 received a major economic windfall from Prop 13. Over time, the market value of properties in California detached from the assessed value, frozen under Proposition 13. 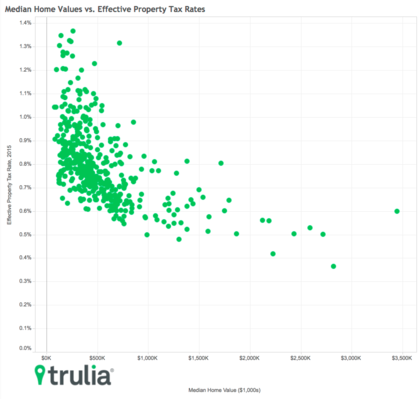 In general, the tax advantage is larger for higher-value property than for lower-value property. Trulia, a real estate consultancy, has estimated the size of the difference for each city in the state (click chart to open a new page with an interactive tool to find your district). With a single vote, Proposition 13 flipped the local and state roles in funding schools. Sacramento suddenly became the center of the universe when it came to school funding in California. In most districts, taxes at 1% of assessed value were not enough to cover the revenue limit requirements set in the Serrano settlement. State appropriations filled in some of the lost funds. California quickly became a state with low property taxes and high state income taxes. 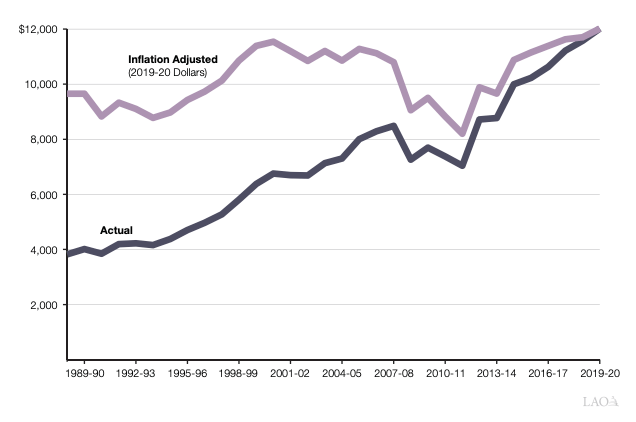 These changes were the starting point for a long decline in California’s investment in public education relative to its history, its economy, and relative to other states and nations. The effect on schools became more and more obvious, much to the dismay of many of the state’s educators and parents. For graphs, see Lesson 8.1 as well as this page on EdSource. By 1988, many Californians had become alarmed at the state of their public schools. School construction had failed to keep pace with growth in the state's population, and existing schools were looking crowded and shabby. (See lesson 5.9 for more about facilities.) Class sizes were trending upward, and schools found themselves continuously making difficult cuts. With Prop 13, voters had made Sacramento responsible for education funding - but Sacramento had other priorities. Education shrank as a percentage of the state budget even as the needs of the system were rising. Proposition 98 gave voters an instrument to force the issue. This ballot measure, passed by a narrow margin, did not add new revenues to the budget. Rather, it amended the constitution to require that a larger and more consistent fraction of the state budget be spent on education, specifically on K-12 education and community colleges (a.k.a K-14 education). the Legislature, with a two-thirds vote, can suspend the funding requirement under Proposition 98 in any single year. Calculating the precise Prop 98 guarantee each year is complicated, and the stakes are high. Most education-related expenses are considered part of the Proposition 98 budget, but not all of them. For example, funds for after-school programs are not counted as part of Proposition 98. Every year, a cottage industry of lawyers, consultants and advocates earns a living debating and explaining the interpretation of Proposition 98. The process consumes a great deal of energy in the annual budget process. For a summary of the sequence of legislation that led to Prop 98, this paper by Virginia Alvarez is hard to beat. It is unfortunate that Proposition 98 has caused California’s leaders to fight budget battles on the grounds of legal details rather than on the real needs of students. On the other hand, having a rule in place does support the idea that the conversation should involve real numbers. For example, in the Great Recession the Legislature had to use a wide range of accounting "solutions" to divert funds from education. By 2011, the cumulative shortfall (or “maintenance factor”) gap between the real budget for education and the Prop 98 “guarantee” exceeded $12 billion, roughly $2,000 per student. The imperative for the state to restore education funds to the level guaranteed by Prop 98 helped convince voters to temporarily raise taxes in 2012. Governor Jerry Brown put Proposition 30 on the ballot asking for an increase of about $6 billion in income and sales taxes to supplement the state’s general fund. With the income taxes about to expire in 2018, voters approved Proposition 55, which extended the income tax on high earners through 2030. Education funding in California shriveled during the Great Recession. It took seven years for funding per student to return to pre-recession levels, adjusted for inflation. Which statement about Proposition 13 is FALSE? Proposition 13 reduced property tax rates on residential and commercial property. Proposition 13 amended the California constitution. Proposition 13 made the education budget more volatile because revenues are now strongly influenced by taxpayers' gains and losses in the stock market. This is a great lesson for people to gain a better understanding of how our public education funding has been impacted by legislation and why we’ve seen such disparities amongst school communities across the state. It also helps explain why we need to keep pushing for full & adequate spending. We’ve already seen a shift since 2014, but we have to remember that we started back seven years, so we are still catching up. Progress is progress and I’ll take it. If you are interested in a little more on Proposition 98, the legislative analyst has some reading just for you: A Historical Review of Proposition 98. Thank you, Carol. This is a great additional resource. Thanks for the June 2015 update. The graph shows one of the realities of Califonia K-12 funding, we have recovered to pre-2012 levels, and, if you do the 'lowest state' comparisons (as ED100 does elsewhere), California is not in the lowest 1/5 anymore. (aproximately). Does more money, itself, solve education problems? Economics Professor Hoxby at Stanford has a section in her undergraduate Education Economics class, answering that (with data) in the negative. Effective programs and their effective implementation are more important that just more enabling dollars. I do agree - effective teaching methods and program implementation are critical for student success. However, increased funding helps to acquire critical resources to make this happen, including: more teachers, counselors, social workers and family & community liaisons; updated technology, including checked out devices & wi-fi; learning expeditions; professional development and trainings for staff and families; tools to implement new programs (e.g., personalized learning initiatives, Leader-in-Me, Arts, CTE, coding, Maker Labs, STEM, literacy supports I can obviously keep going.) There is definitely a need for accountability to go along with increased funding (nod to LCAP) and to implement research-based practices for the system to progress with effectiveness.